The Extensograph and the Alveograph have many properties in common. Nevertheless it is interesting to note that most inquiries on optimization concern the Alveogram. 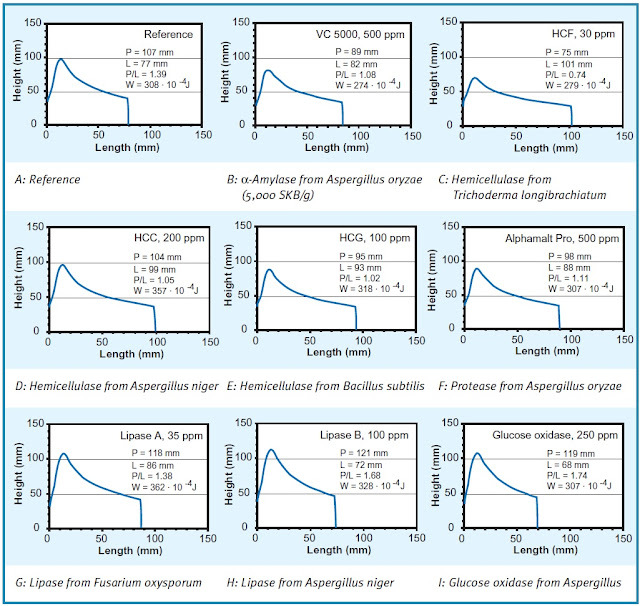 In particular, wishes for modification include the extensibility and resistance of the Extensogram, the L-value and the P-value of the Alveogram, and also the P/L ratio of the Alveogram. Sometimes the areas beneath the curves (equivalent to the energy input) need to be modified. Increasing the resistance of the Extensogram or the P-value of the Alveogram does not seem to be difficult, since hardly any inquiries ask for it. And in fact applying oxidizing agents effectively increases both. Fig. 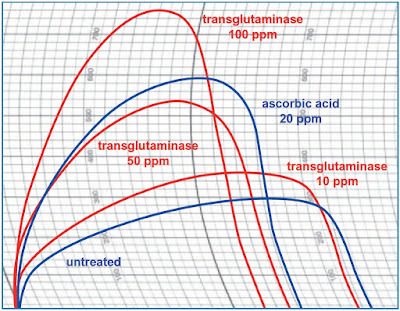 141 depicts the effect of ascorbic acid and potassium bromate respectively on the resistance of the Extensogram. 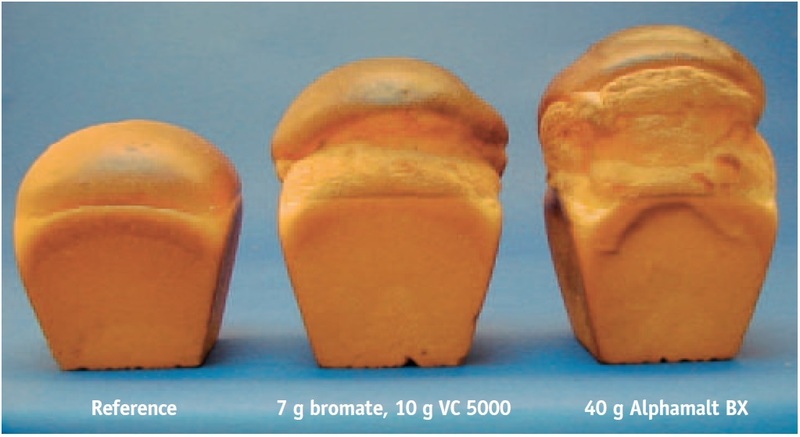 As potassium bromate is a rather slowly-reacting oxidizing agent, its effect can hardly be observed after only a short incubation time (Fig. 141, curve PBr 45'). 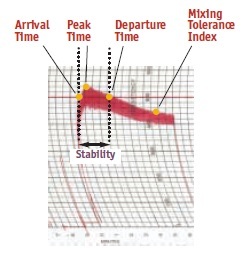 Consequently, its impact on the Alveogram will not be very strong within the standard dough processing time of 28 min. 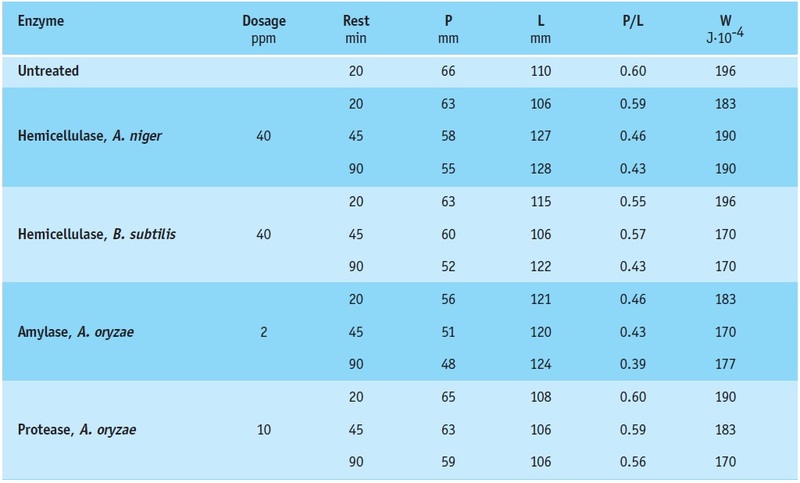 Prolongation to 2 or 3 h will make it more obvious (Fig. 142). Of course the effect of enzymes will also be more pronounced after a longer resting period of the dough (Tab. 93). Transglutaminase is a cross-linking enzyme that connects protein chains by forming lysineglutamine bridges (Fig. 143). The cross-linking results in an increase in the stability of the protein. Using the Extensograph, an increase in the resistance and a reduction of the extensibility can be measured (Fig. 144). 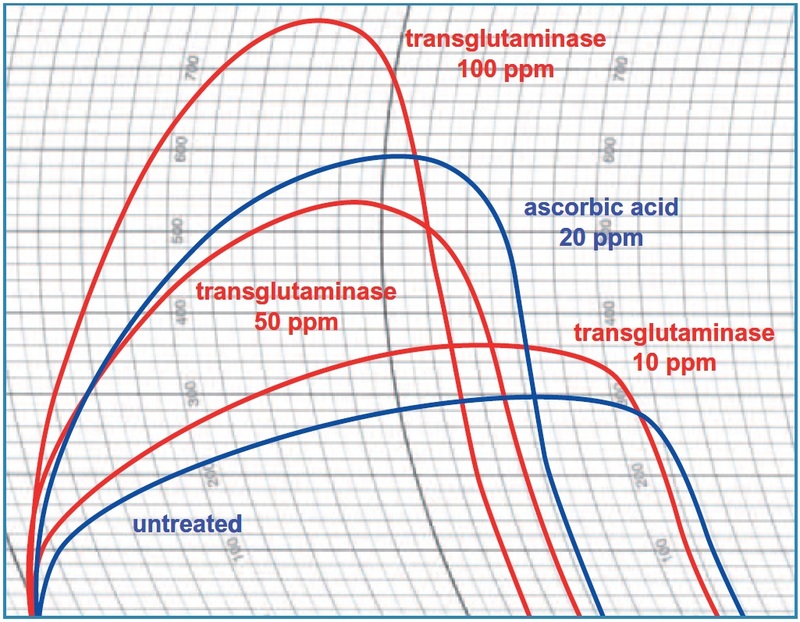 Since transglutaminase is still a rather expensive enzyme, its use is recommended chiefly in prolonged fermentation processes where a small quantity has sufficient time to achieve the desired effect. Increasing the extensibility is a more delicate task. 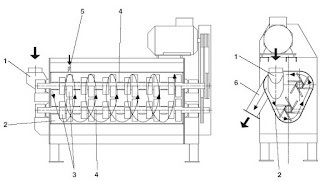 For this purpose it is necessary to soften the dough, but too much softening will result in early rupture of the dough strand (Extensogram) or bubble (Alveogram); this is reflected in an even shorter curve. Dough is a complex system composed mainly of starch, water, protein and pentosans. 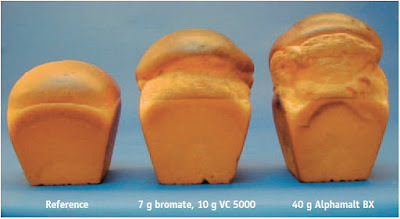 The gluten formed by protein and water certainly plays a predominant role in dough rheology, but the other components have significant effects too. The starch competes for the water present in the dough, and so do the pentosans. In addition, the pentosans probably form complexes with each other and with gluten (Neukom and Markwalder, 1978; Hoseney and Faubion, 1981). 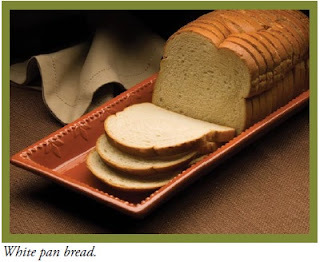 So releasing water from starch or the pentosans would improve the hydration of the gluten. Destroying the network of protein and pentosans would also increase the softness of the dough. 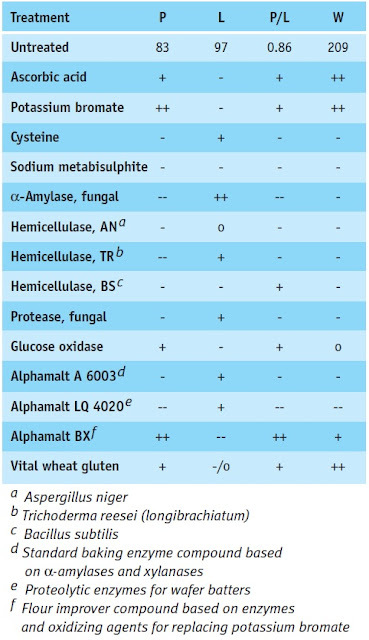 A good approach would therefore be to keep the protein as intact as possible, maybe counteracting an excess of stability with some cysteine or specific proteases, but to focus on the starch – particularly the damaged moiety – and the pentosans. Both can be effectively degraded by enzymes. Fig. 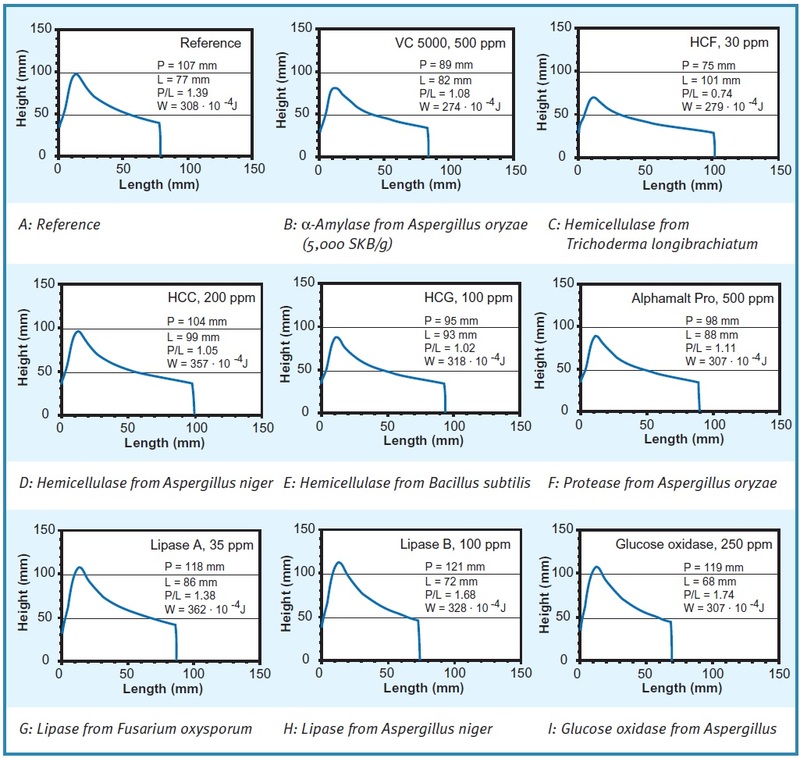 145 proves that with the aid of amylolytic and hemicellulolytic enzymes (A - E) an increase in extensibility is feasible, accompanied by a decrease in resistance; but it can also be achieved with specific proteases (F). A lipase from Fusarium oxysporum (G) increased both extensibility and resistance, whereas a lipase from Aspergillus niger (H) only increased resistance and reduced extensibility. 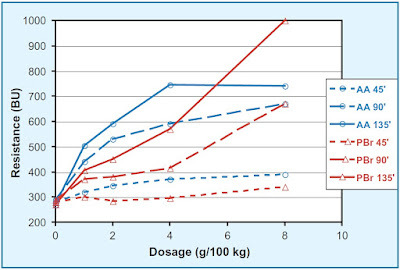 Furthermore, the Alveograms with glucose oxidase (I) showed a reduction of extensibility and an increase in resistance. Using combinations of amylases and hemicellulases it is possible to keep extensibility constant while resistance is increased (Fig. 146). The resulting increase in the area under the curve (energy) is an indication that a better volume yield in baking is likely. Kieffer (2003) has recently published results from comparative investigations into dough rheology and volume yield. He concludes that only resistance is positively related to baked volume. This is quite surprising because all reports from bakers indicate that extensibility goes along with volume provided that sufficient resistance of the dough can be achieved, e.g. with oxidizing agents. In articles The Role of Gluten Elasticity in the Baking Quality of Wheat , Kieffer adds further arguments to his view. Tab. 94 provides a summary of the effects of various flour improvers on the Alveogram. It should be mentioned again that at much lower or higher dosages, rather different tendencies may be revealed. 4. Don't Believe in Numbers only – Bake! Rheological methods are effective means of checking flour quality when milling wheat of rather homogeneous composition. Large fluctuations in wheat properties should lead to re-adjustment of the specifications, because certain parameters may fluctuate without the baking performance being impaired. 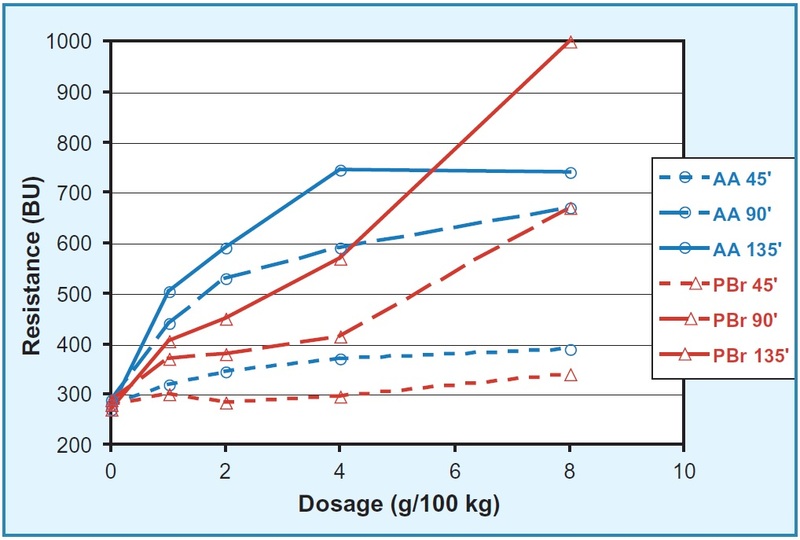 If treated flour is to be evaluated by rheological methods, the specifications usually have to be quite different from those for untreated flour. Fig. 147 shows the Alveogram for what is probably the most successful bromate replacing compound worldwide. Nobody used to Alveograms would even dare to treat flour with this improver. Nevertheless, under the typical conditions for which this product was designed, it achieves superior baking volumes (Fig. 148).